Amity Kurashiki has a variety of students, ranging from 6-month-old babies to high school students. You can take lessons here at Amity not only for conversation but also for English grammar and preparation for STEP or TOEIC. As we are located near Kurashiki station, many students come from Tamashima, Chayamachi, Okayama, Asakuchi, Kasaoka and Soja. Students from all ages enjoy their English lessons. The Bikan area is one of Kurashiki’s famous tourist spots. Its historic buildings and museums attract many visitors. This is a Baby class. All of our babies love their teachers and moms have fun in the lessons as well. Children under 6 years old have lessons on the floor. In this class, everyone is seriously listening to their teacher and following her instructions. We can take good care of each student in small group lessons. Our students love their computer lessons. 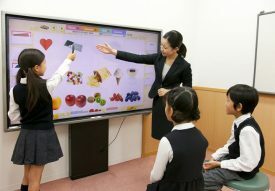 Each student has their own PC and enjoys learning not only English but also how to operate it.